Mixed connective tissue disease (MCTD) is often viewed as a “cousin” of systemic lupus erythematosus (SLE), with which it shares many disease features. Some experts regard MCTD as a variant of SLE because of the considerable overlap in clinical and serological manifestations. Others consider it to be a unique disorder because of the frequency with which certain phenotypic features occur in patients classified as MCTD. Patients with MCTD by definition have antibodies directed against ribonuceoprotein, i.e., anti-RNP antibodies. 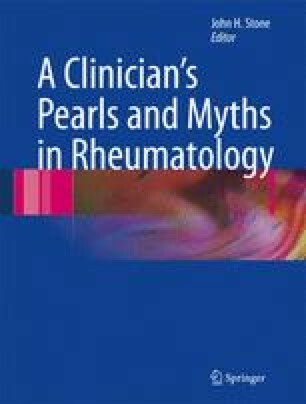 Common clinical manifestations of MCTD are arthritis, Raynaud's phenomenon, digital ischemia progressing to fingertip ulceration, pulmonary hypertension, interstitial lung disease, and gastrointestinal hypomotility. Some patients with MCTD evolve with time to a clinical phenotype that is more easily classified as SLE. Others, perhaps a majority, evolve over time to clinical syndromes most compatible with systemic sclerosis. MCTD must be distinguished from “undifferentiated” connective tissue diseases (in which a clear-cut rheumatological process may or may not emerge with time) and also from “overlap” connective tissue diseases, in which the disease features of two or more well-defined connective tissues diseases are present in the same patient. As example of an overlap connective tissue disease is the occurrence of SLE and polymyositis in the same patient. Such a patient would not be regarded as a “mixed” connective tissue disease (MCTD), but rather as the cooccurrence of two diseases in the same patient.